Address relationship, sports performance, irrational fear, chronic anxiety, indecisiveness, insomnia, panic attack, or depression issues. Kristen can help you make the shift that changes everything. Do you want to improve your productivity? If you’re taking risks at work, you ARE going to feel fear. In particular fear of failure. Learn how to navigate this challenge. If you want to shift a relationship from chaotic / frustrating to calm and loving, it’s time to look at your fear. Learn how to explore it in a non-threatening way. Do you want to improve your sports performance? Fear can either be your greatest hold back, or a source of motivation, focus and aliveness. Learn what makes the difference, giving you the distinctive edge you seek. Kristen Ulmer is a thought leader and fear specialist who draws from her tenure as the most fearless woman extreme skier in the world for 12 years, from studying Zen for 15 years, and from facilitating thousands of clients on the subject of fear and flow states. 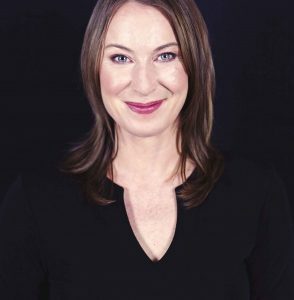 Her game-changing work has been featured in such media as NPR, The New York Times, Wall Street Journal, Forbes, USA Today, Outside Magazine, and many more. 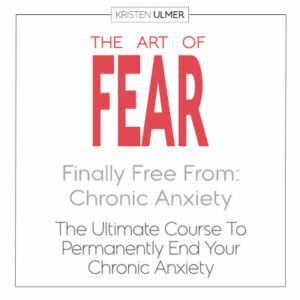 Kristen is the author of: The Art of Fear: Why Conquering Fear Won’t Work and What to Do Instead, which radically challenges existing norms about what to do about this misunderstood emotion. Order today and receive a FREE gift. 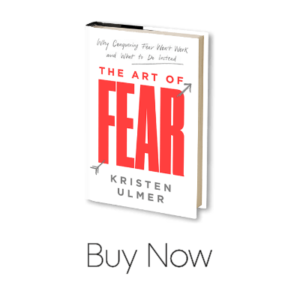 The Art of Fear is an authentic, original, and deeply helpful guide for turning fear to your advantage. Drawing on a lifetime’s experience as a top-ranked extreme skier, Zen practitioner and sports coach, Kristen Ulmer offers us a manual for living with freedom and joy in the midst of all the competing voices that arise to derail us on the journey. This is a book that comes directly from a courageous heart, and should inspire you to live with the same radical courage! For years, I dangled my ski tips over the edge of cliffs. Kristen got me to actually jump. Whether on snow, in your career, or just life itself, no one owns fear better than Ulmer. I've worked with Kristen through her ski camps for several years. One thing I can guarantee is that whether you're a professional athlete, running a business or looking to live a more authentic life, Kristen will show you the path to championship performance. Read this book if you want to know the reason behind many of your struggles. It explains, simply, everything. What to do about fear eluded me until I met Kristen. I now use her advice daily, especially when my life is intense and busy, to take the pit out of my stomach, do a better job at work and get much needed sleep. You are going to love this book. Beautifully blending practical, personal, and philosophical insights, Kristen Ulmer has expanded my mind and changed my life. Read “The Art of Fear” and you’ll always be scared again -- but only in the best possible way. 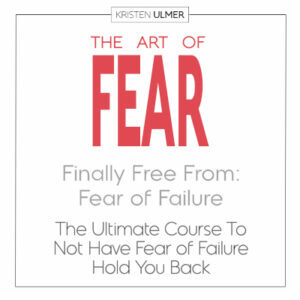 Learning how to have an intimate relationship with fear is one of the best things you can do, and Kristen is masterful at teaching you how to do that. Everything you ever wanted to know about fear. Ulmer takes a radical approach to an age-old problem and delivers smart, exciting and extremely fresh ideas. People have been avoiding or medicating away Fear and Anxiety for too long, and we need a more integrative approach. Finally, someone who is clear about this enormous and important subject, with great practical advice that is simply spot on. This book will turn the fear and anxiety world on their heads. Who better than Kristen Ulmer to introduce us to our constant companion, Fear, and turn him from an enemy to a friend? But this book is about so much more as well - how to embrace every moment of life with open arms. Memorable!